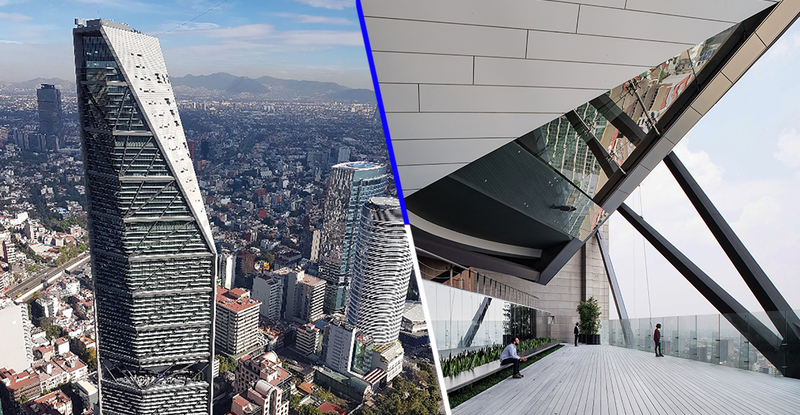 Jewish Journal Mexico – The best skyscraper in the world is Mexican, 246 meters high, has the shape of an obelisk and is the work of the architect Benjamin Romano: it is the Torre Reforma. This was announced on November 1 in Frankfurt, Germany, in the framework of the International Highrise Award 2018, where the jury highlighted its originality because practically everything is outside the common standards. The building is located on Paseo de la Reforma and was completed in 2016. It is currently the tallest in Mexico City. In an interview with the newspaper Reform, the architect Romano pointed out that the building was the only one in America that was competing because all the others are in Asia, since in that continent they are producing the prototype highrise. Torre Reforma is unusual, because it is a hanging and tectonic building that understands its boundaries and context. I think that is very valuable and very flexible ",architect Benjamin Romano. The building competed with proposals designed by some of the most recognized architects worldwide such as Norman Foster, Rem Koolhaas, Jacques Herzog and Pierre de Meuron. The International Highrise Award is held every two years and in it buildings from all over the world that have been completed in the last two years compete.